Thornton's Whitewater Rafting Resort, Cabins & Campground is located 18 miles northwest of Crivitz, in Northeastern Wisconsin and is open year round. 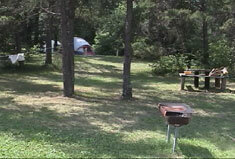 The resort offers Whitewater Rafting, Camping, Housekeeping Cabins, Swimming, Kayaking, Fishing. The bar at Thornton's Resort is open year round and serves hamburgers, pizza, and snacks as well as your favorite beverage. 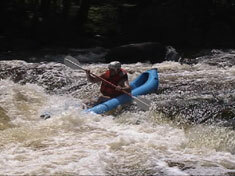 The Menominee River offers class IV rapids and is a guided trip run in 5-8 person self-bailing rafts. The Menominee River is a scenic 45 min. drive from our resort and begins at the beautiful 200' cliffs bordering WI and the UP. Down river you will experience the famous "Piers Gorge" which we run twice. Please e-mail us or call 715 757-3311 for reservations. Trips run daily at 10am and 2 pm. Cost includes guide and all gear. For over 30 years, Thornton's has been providing one of the most thrilling and memorable whitewater rafting experiences in the entire Midwest. Rafting trips are run daily April through October on the Roaring Rapids section of the Peshtigo River. Guaranteed to include crashing whitewater rapids to gentle stretches of river that last just long enough for you to catch your breath and enjoy the spectacular beauty and wildlife of the area. Our cabins are open during the winter for Snowmobiling, Ice Fishing, and Snowshoeing. 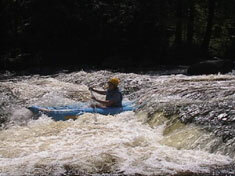 Come up and enjoy the spring run-off in April and early May offering Class IV Whitewater Rafting. Thornton's professional, friendly staff will guide you on the 5 mile trip, approximately 3 hours, in the best quality equipment available including funyaks, the next best thing to kayaking. Funyaks are stable single person, self-bailing kayaks that offer you all the fun-packed action of a kayak. All equipment, instruction, and transportation are included. Leave the hectic city living behind, kick back, relax and experience a leisurely, fun filled, scenic gentle stretch of the Peshtigo River. Enjoy 4 miles of spectacular beauty, see eagles and hawks soar overhead and watch wildlife along the way. Trip is run in rafts, lasts about 3 hours and costs $20.00 per person. Coolers are permitted on this trip. Shuttle and life vests are included in the price. Minimum of 8 people per reservation. Call 715- 757-3311 for reservations. Thonton's Resort offers 5 paintball courses: Our Strategy Courses and a Speedball Course. Three hours of play costs $44.00 per player with a minimum of 6 players. Pay for 11 and the 12th person is free. If you bring your own gun and belt, the cost is $35.00 per person. 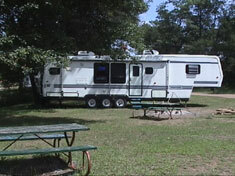 Catering to the outdoor enthusiast, Thornton's large campground offers 40 large sites with water and electricity available, secluded wooded tent sites, and group sites. Each site has its own firepit and picnic table. There are large, modern shower/restroom facilities. Thornton's Resort offers two new 3 bedroom cabins that will sleep up to 10 and three modern 2 bedroom cabins. All cabins have showers, complete kitchens facilities, bed linens, foldout futon in the living room area, and large yards with a private firepit and picnic table. Other fun activities offered are swimming, paintball, fishing, hiking, and biking. Thornton's Rafting Resort provides some of the best fishing for Walleye, Bass, Perch, Muskie, and Crappie in Caldron Falls Reservoir, the 1300 Class A Musky Lake across the road and within walking distance of the resort. Caldron Lake has a boat launch, sandy swimming beach and is large enough for water sports such as waterskiing, tubing, or wakeboarding. Lake kayaks are available for rent to enjoy Caldron Falls Lake. $25.00 per 1/2 day. Each kayak has a fishing pole holder. Fishermen also enjoy fishing on the Peshtigo River. WINTER FUN: Cabins are open year round for winter enthusiasts who want to enjoy snowmobiling, ice fishing, and snowshoeing. Our cabins are right on the Iron Snowshoe Trail, a beautifully groomed trail that you can ride for hundreds of miles in any direction, enjoying the natural beauty of the north woods. Don't forget about our Human Ice Bowling. 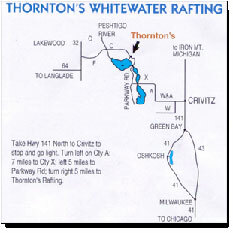 DIRECTIONS: Thornton's Whitewater Rafting Resort & Campgrounds is located in Northeastern Wisconsin, just 70 miles north of Green Bay. Take Hwy 141 to Crivitz. In Crivitz, turn west and follow Cty A to Cty X. Turn west on Cty X, follow the signs to Parkway Road, turn right (north) and follow Parkway Road for five miles till you see Thornton's Rafting Resort & Campgrounds.